Some combinations are simply synonymous with the holiday season: Santa Claus and his reindeer, carolers and your front door and the red and green color palette that resides on everyone’s Christmas tree. While we love tradition, sometimes you have to break the rules. This year, rather than throwing your hodge-podge of holiday decorations up all together, think about selecting a consistent theme for the year’s décor. Who knows—you may just start a new tradition! The natural look is here to stay! Forgo the metallic sheen of icicle lights and dangling ornaments for a more rustic color palette. 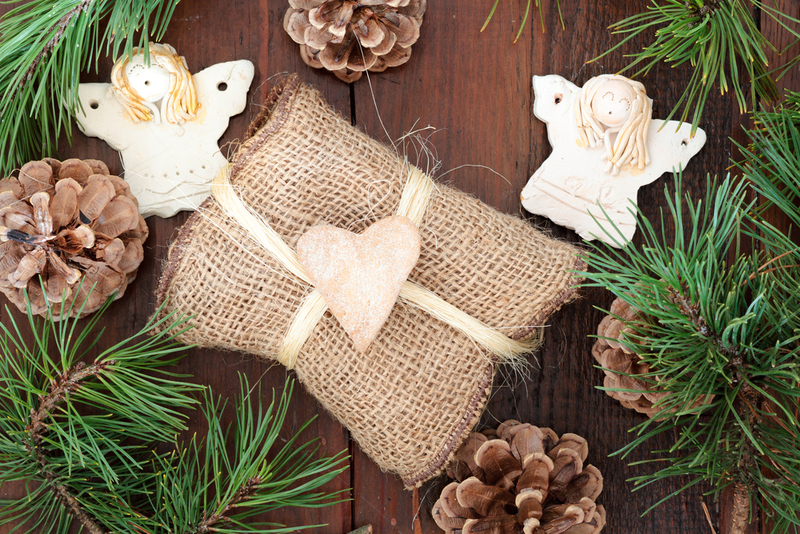 Focusing on colors like white, cream, beige and brown, decorate your tree with burlap instead of tinsel. Hang large strung bulbs instead of twinkling lights. Look for twine ornaments and decorative wood slices instead of the classic globe pendants to get this soft look. Red and blue don’t have to be confined to the Fourth of July. Create an all-American Christmas tree with navy blue ribbon, red ornaments of different sizes and sheens, and a golden star tree topper. Opt for a red wagon or pail instead of a traditional tree stand and skirt. 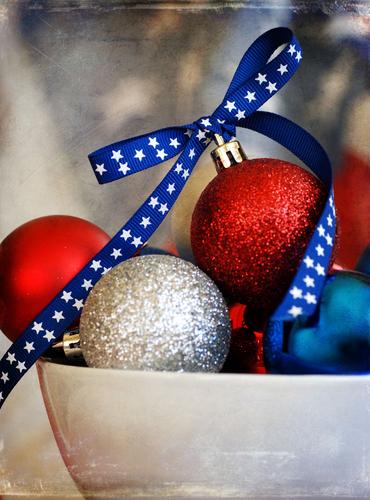 Finish with a few unique ornaments of your own like tiny American flags, bells, sails or boats, and voila!—a star-spangled Christmas tree. 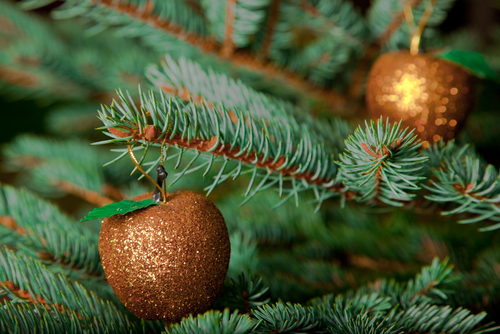 If you prefer your decorations to be elegant, consider using a green, gold and brown color palette. Traditional and refined, these colors create a decadent look when paired with organic elements like pinecones, magnolia leaves, dried twigs and aromatic holly or rosemary. Add yellow-tone twinkling lights and iron candelabras near the tree for a sophisticated scene. 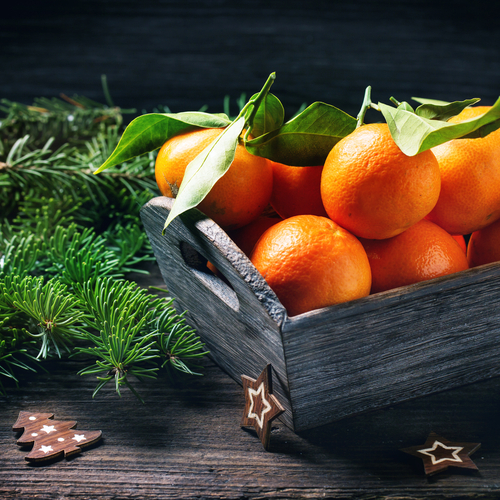 Lime green, vivid orange and cheery yellow can be combined to form an upbeat Christmas color palette. If your décor style is eccentric and ‘anything but traditional,’ try adding bright green round bulbs, dried orange slices and lemon-shaped pendants for a one-two punch of creativity. To tone down and complement the brightness, add deep burgundy leafy elements and pass on the typical twinkling lights. The holidays are a time to bring out our most creative selves while preparing for family dinners, elegant banquets or just gathering around a well-decorated tree. With so many eye-catching palettes, which will you choose this Christmas? California interior designer Kerrie Kelly heads up Kerrie Kelly Design Lab, and is the author of the book Home Decor: A Sunset Design Guide. Kerrie's holiday color and design tips will keep your house shining through this upcoming season. Kerrie writes for Home Depot; you can review the store’s wide selection of Christmas decorations online.